'My home country still suffers from poverty and many problems. Though my performance as Miss Thandi and Raymond, I want the Dutch to experience my culture. And at the same time help my fellow country men.' Miss Thandi/Raymond Matinyana, Amsterdam's renowned cultural ambassador for South Africa has died. Two year ago my blond locks stood on end, when I heard Miss Thandi was moving into the same business as mine: the organisation of jazz afternoons in travesty-cafï¿½ Lellebel. Years in the gay- and travesty scene had turned me into a suspicious little woman. My first thought was: 'He's stealing my idea!' No such thing, Miss Thandi wanted to perform with me at cafï¿½ Lellebel. My uncontroled outburst even rather upset him. All he wanted was to make jazzy music with a couple of people. hankful, I soon realised Thandi operated on a different level from the usual drag queen. 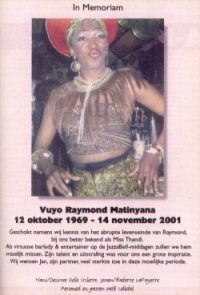 She wasn't a militant drag queen, but a South African singer and dancer whose only wish was to introduce the South African culture to the Dutch audience. Together we assembled a fantastic group of musiciance, with whom we performed monthly afternoon jazz session throughout the season. Jazzabell becme a succes, and Thandi's way of thinking and living was a great inspiration to me. Raymond once told me: 'I want to touch the audience in a literal as well as methaphorical sense.' He achieved that in many ways. 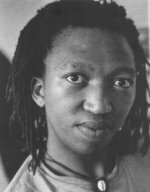 Next to his travesty performance as Miss Thandi, he was the driving force behind the Afro Vibes Band, a band with musicians from all over the world. He also brought many South African groups to the Dutch stage. Together with three others, he set up the Afro Vibes Foundation to collect money for scholarships for the South African youth. He knew as no one else that the only escape from poverty and hopelessness of the township was though education. Wednesday November 14 Raymond died unexpectedly of a liver disease caused by Hepatitis-B. It's incomprehensible why some who's achieved and done so much for others in his short life has to die at the age of 32. The inextricable bond between Raymond and his life partner Jan has also abruptly ended. The only solace is that he touched more people than an average old age pensioner. I miss him, I wish everyone who was moved by Raymond, courage. I hope the sadness and anger about this great loss will make place for gratitude.